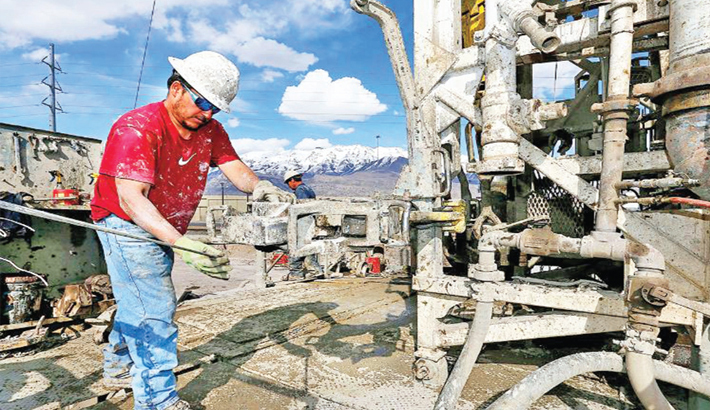 A driller at a rig in Orem, Utah. The US rig count, an early indicator of future output, is still a bit higher than a year ago. Houston: US energy firms last week reduced the number of oil rigs operating for a fifth week in a row to its lowest in nearly a year as independent producers follow through on plans to cut spending on new drilling with the government cutting its growth forecasts for shale output. Drillers cut nine oil rigs in the week to March 22, bringing the total count down to 824, the lowest since April 2018, General Electric Co’s Baker Hughes energy services firm said in its closely followed report on Friday. That is the first time the rig count has declined for five weeks in a row since May 2016 when it fell for eight consecutive weeks, report agencies. More than half the total US oil rigs are in the Permian basin, the nation’s biggest shale oilfield, where active units fell by six this week to 459, the lowest since May 2018. The US rig count, an early indicator of future output, is still a bit higher than a year ago when 804 rigs were active after energy companies boosted spending in 2018 to capture higher prices that year. US oil output from seven biggest shale formations, the nation’s major producing regions, was expected to rise by 85,000 barrels per day (bpd) in April to a record 8.59 million bpd, the US Energy Information Administration said in its monthly drilling productivity report on Monday. US crude futures rose over $60 a barrel this week for the first time in four months due to supply cuts by the Organization of the Petroleum Exporting Countries (Opec) and its allies and US sanctions on Iran and Venezuela.